Here we go – Friday Night Lights! Visiting Orange Lutheran (OLU) Lancers, led by recently hired Jason Presley, a longtime coach and player for the Lancers. 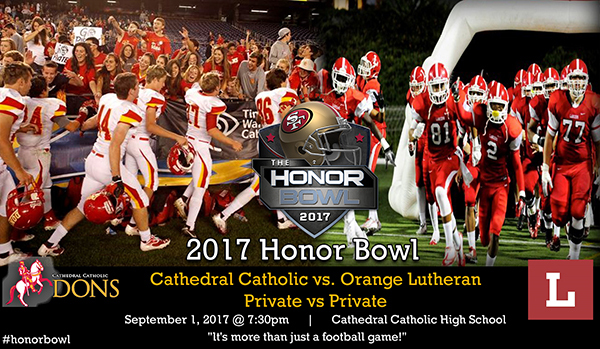 This will be the second trip for OLU to an Honor Bowl Showcase and the school and community are excited to be in the final game vs a home town crowd playing Cathedral Catholic. Rising Junior QB Ryan Hilinski will be returning to lead the Lancers after a 2015 season with 1582 YDs, 12TDs in a tough Trinity league. Cathedral Catholic (National #16 State #4) had a stellar 2015 season. Head Coach Sean Doyle and his staff rode through an undefeated schedule and ended in Sacramento victory for the CIS State D1A title. The Dons will rebuild now that the seniors have moved on but Coach Doyle welcomes an undefeated JV squad to join the returning Varsity and play high caliber football as they have done consistently over the years. Private vs Private – all playing for those who give it all! What a way to conclude the first of two stellar day’s in the 2017 Honor Bowl showcase.